Thank you to Tate+Lyle® for sponsoring this post. Today I’m sharing a taste of Britain with you, a quintessential dessert that has been enjoyed at tea time for ages. 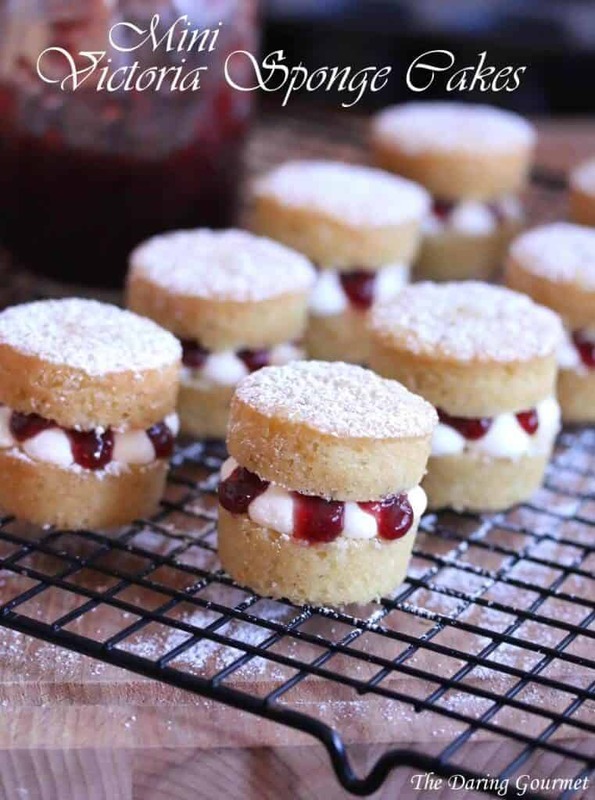 Exquisitely rich buttercream and jam are sandwiched between two delicately soft and buttery sponge cakes. 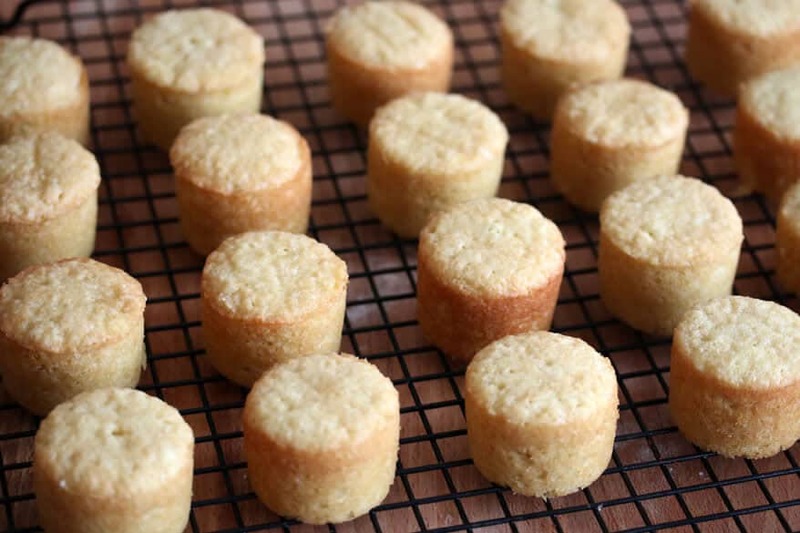 This version comes in miniature form of the traditional full-sized cake, allowing you to conveniently pop mini bites of heaven into your mouth over and over…and over.And while we’re on the subject of “mini”, how about starting with a brief history lesson? British afternoon tea, a tradition going back many generations. Its origins trace back to Queen Victoria and Anna the Duchess of Bedford who served as her lady-in-waiting (ie, personal assistant) for 10 years. 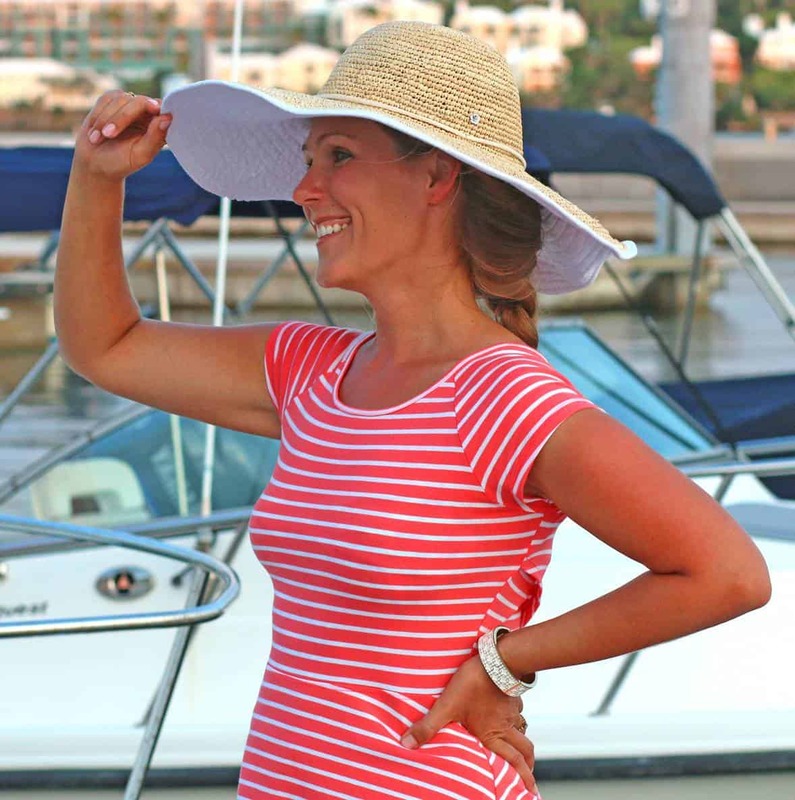 During her service to the Queen, Anna discovered that every day around late afternoon she would experience what we now recognize today as carb cravings. So she started a personal tradition of setting aside that time of day with her servants to enjoy a cup of tea to help wash down a few sweet indulgences to hold her over until dinner. The idea gained popularity (no surprise!) and before long she began inviting guests to join her. 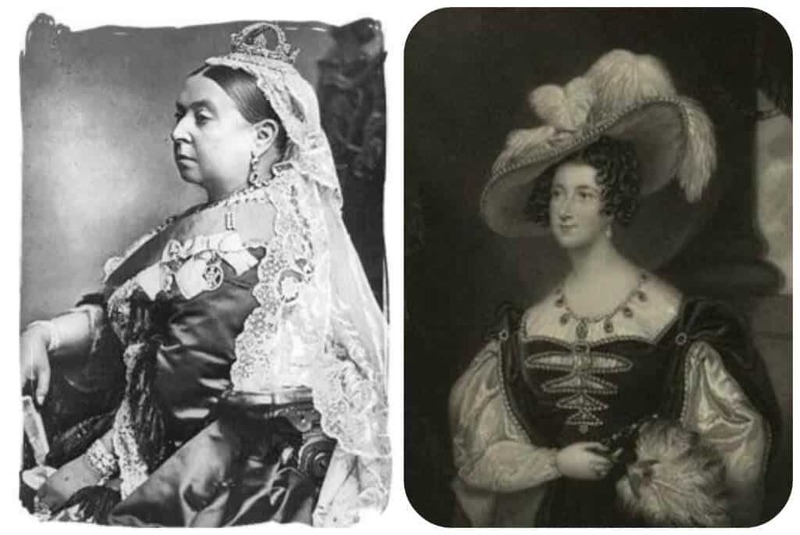 Queen Victoria also began hosting lavish tea parties and guests were expected to attend wearing formal attire. Soon a whole spectrum of tea-time desserts made their way into British food culture. 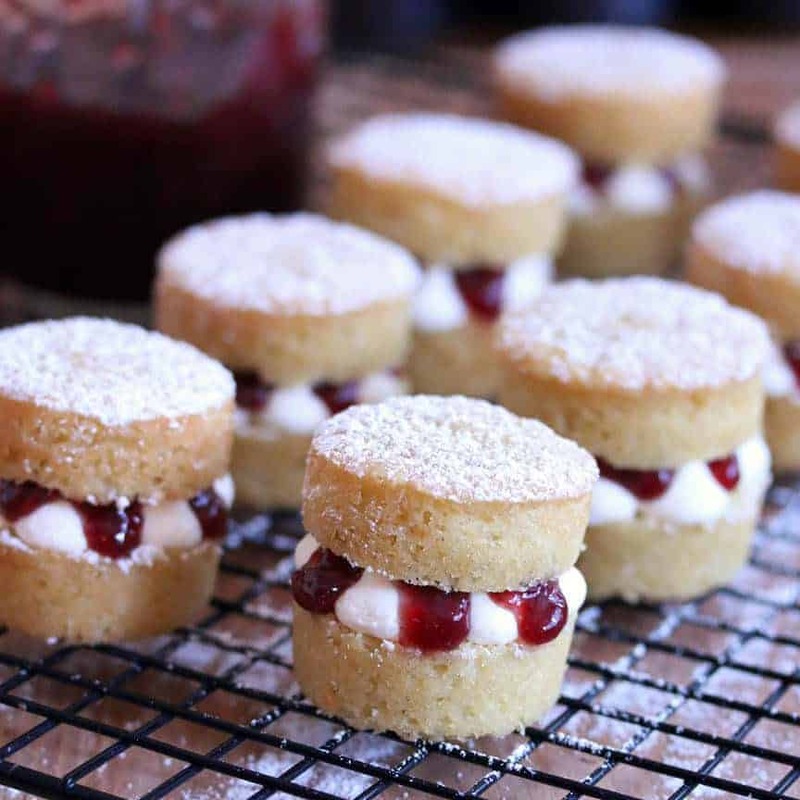 The cream-jam filled sponge cakes became Queen Victoria’s favorites and they were named after her.So what it comes down to, this long-held tradition of afternoon tea is simply the perfect excuse to indulge your sweet tooth in the middle of the day. But indulging in the guise of “afternoon tea” manages to turn what would otherwise be a primal-driven physiological carb-craving response into something refined and…”proper.”And that works for me. Today I’m introducing you to another decadent sweet you can add to your repertoire of tea time indulgences. We’re going to add a modern twist to this very traditional British dessert. 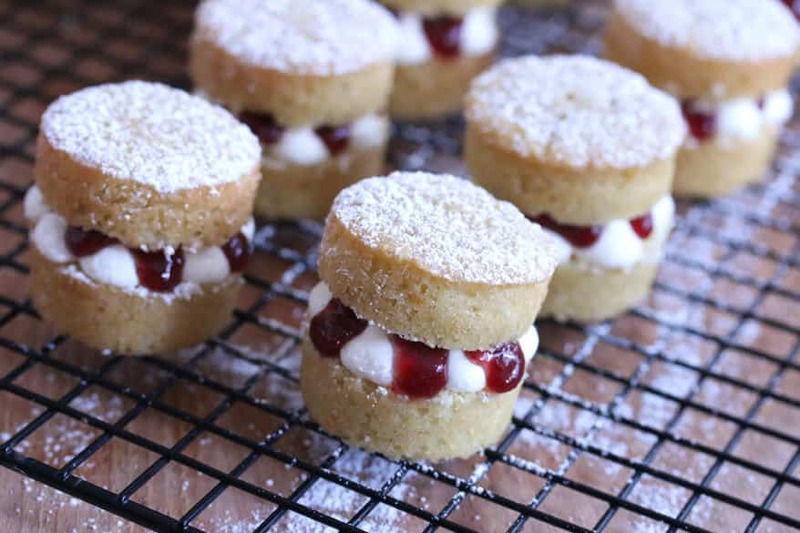 It’s Victoria Sponge Cake, in miniature form. As this is a British dessert it’s only fitting that I’ve enlisted the help of a British product to make them. Tate+Lyle® Sugars has graced Britain’s finest tables, including those of royalty, making it an integral part of England’s epicurean history for over 130 years. I was first introduced to their products during the 6 years I lived in England. I’m thrilled to have been reunited with a few of their fine products. Most people who get into baking sooner or later realize the difference quality ingredients make. Butter is a prime example. But when was the last time you stopped to consider the quality of the sugar you’re using? Let’s make a comparison to put this into perspective. Salt. If you put some regular table salt on your tongue all you’ll taste is…salt. Meaning, it’s less an actual flavor than it is merely a sensation. Next try a few gourmet salts, such as black lava salt with its earthy flavor and smoky top note. Not only are the receptors on your tongue recognizing the saltiness, your taste buds are also enjoying additional, natural flavors beyond the mere saltiness that add new and exciting flavor dimensions to your food. The same is true of sugar. Put a few grains of regular sugar on your tongue. The receptors on your tongue identify it as sweet, but no flavor. That changes when you use quality sugar. 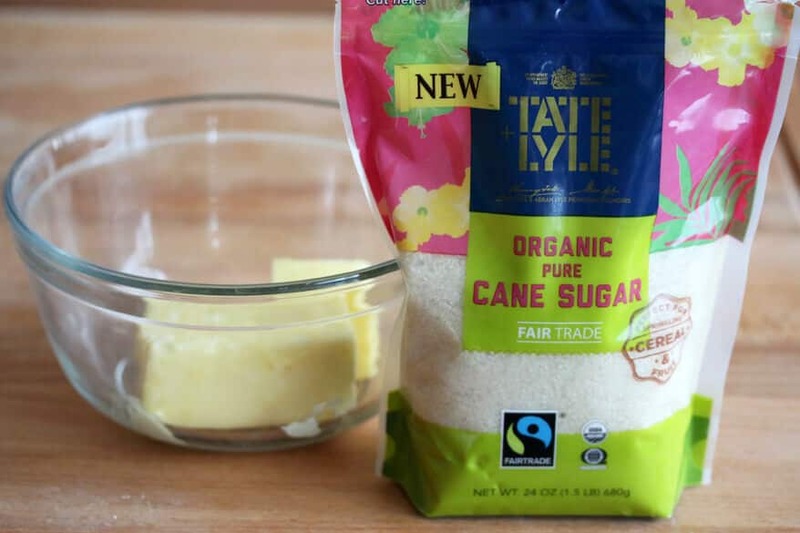 I did my own taste test with Tate+Lyle® Organic Pure Cane Sugar and had everyone in my family do the same, comparing table sugar with a top quality sugar. Beyond merely the “sweet” sensation in your mouth, you’ll detect warm, subtle hints of caramel. The flavor is truly delightful. And the outcome of your baked goods, your tea, or however you use it, will benefit from quality sugar. I lived in England as a teenager and young adult with my family and my husband spent a couple of years there as well. We all get homesick for Britain. I had my family over a couple of weeks ago and served these Mini Victoria Sponge Cakes. Everyone’s reaction was the same: “These taste so British!” And they do. 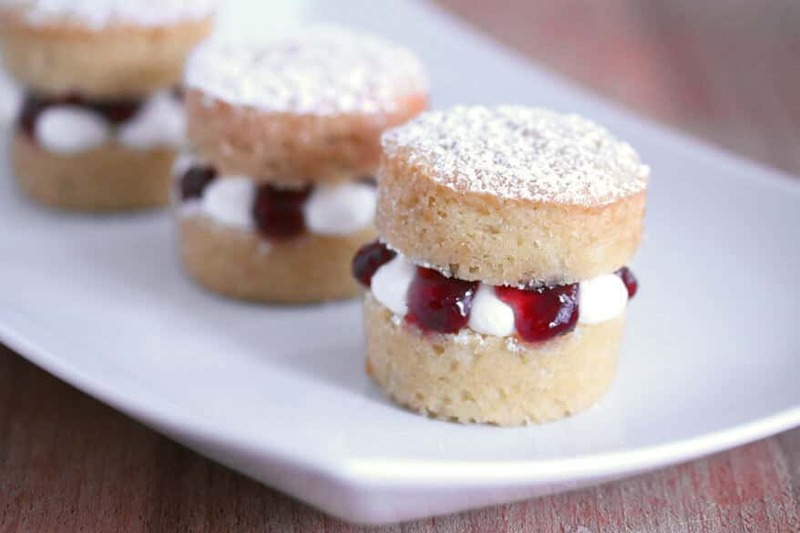 You’re going to love these Mini Victoria Sponge Cakes. 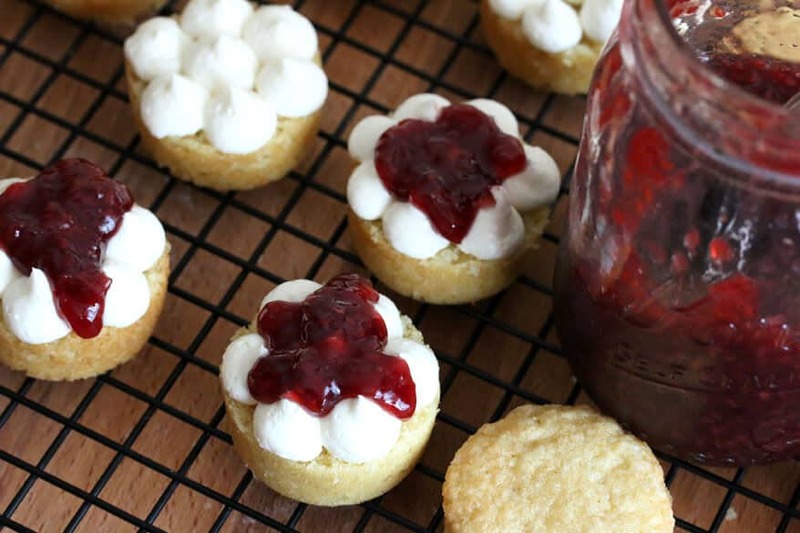 So soft and flavorful with a deliciously rich buttercream and jam filling. 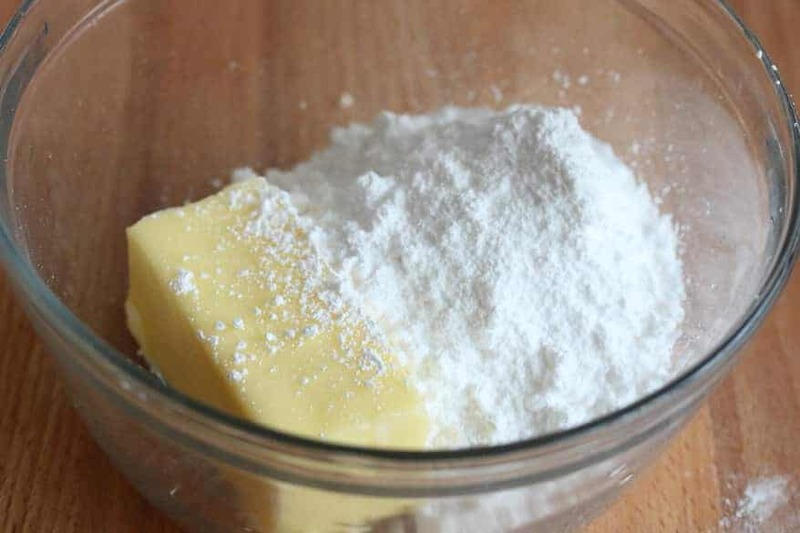 Traditionally Victoria Sponge Cake uses caster sugar, very finely granulated sugar. 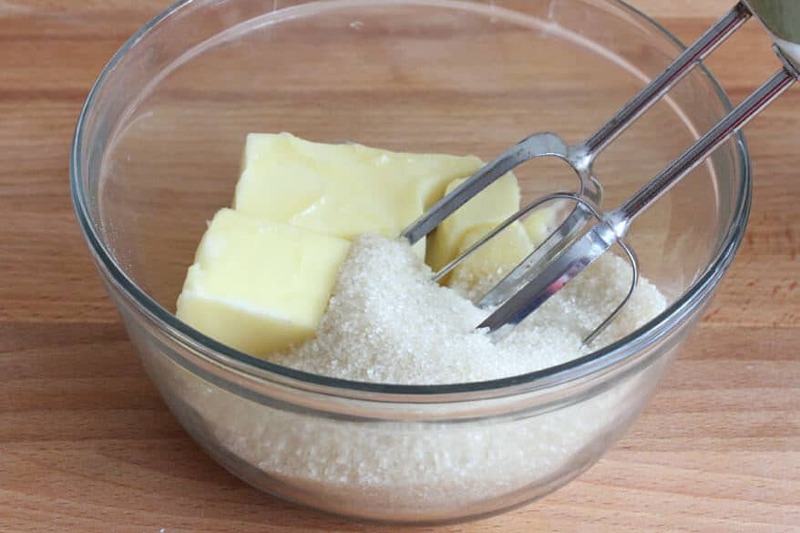 Instead we’re going to use organic pure cane sugar with its natural caramel-like flavor and cream it with the butter for several minutes to create a fluffy mixture that will be incorporated into that delicious sponge cake. Add the pure vanilla extract (use a quality brand). Add the eggs, one at a time, beating each egg until incorporated. 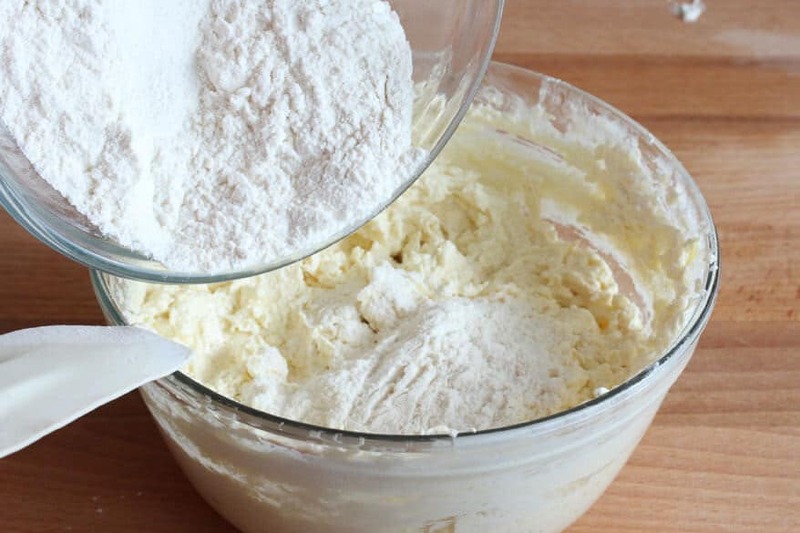 Use a rubber spatula to fold the flour mixture into the wet mixture, stirring just until incorporated. Be careful not to over-stir or the cakes will be dense. Use a non-stick mini cheesecake dish and spoon the batter into each cup until halfway full. I’m using Norpro’s Mini Cheesecake Pan. To make the buttercream, beat the butter, powdered sugar and milk until smooth and creamy. If it’s too dry, add a little more milk (careful, a tiny bit goes a long way). If it’s too runny, add some more powdered sugar. You can simply spread the buttercream onto the cakes with a knife, but for a more decadent look, fill it in a pastry bag with a round tip. Pipe the buttercream onto the bottom half. I piped it in the pattern pictured below to allow the jam to flow down between the dots in a visually nice pattern. Add a dollop of strawberry (traditional) or raspberry jam. Place the tops of the cakes in back in place and sift powdered sugar over the tops. A mini version of a famous British classic! Preheat the oven to 350 degrees F. Lightly butter a nonstick mini cheesecake pan. 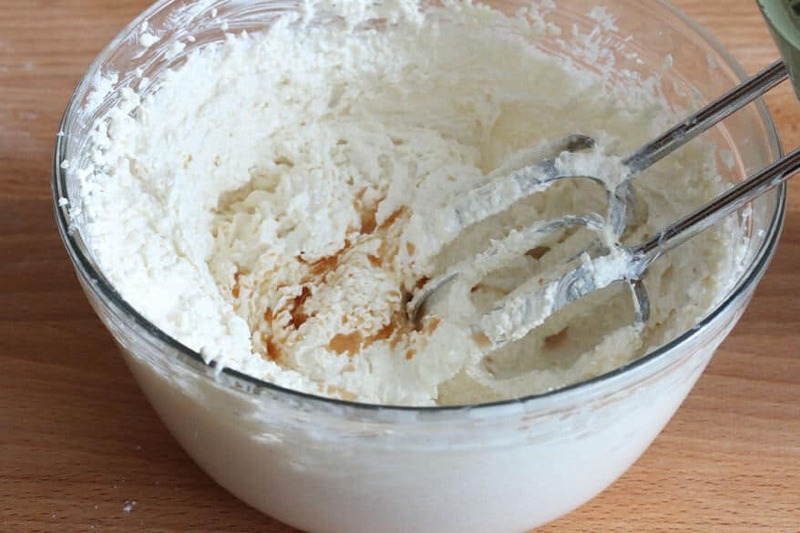 In a large mixing bowl, cream the butter and sugar for 4-5 minutes. Add the vanilla extract. Add the eggs, one at a time, beating after each until incorporated. 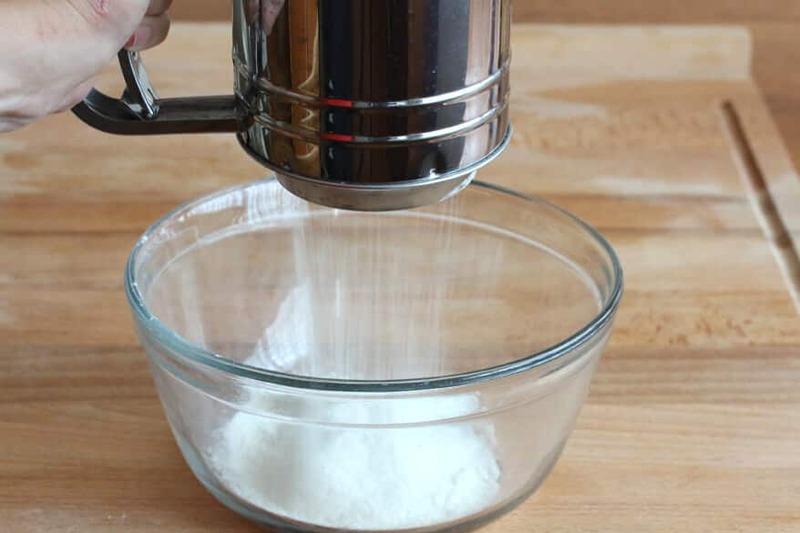 Using a rubber spatula, fold the flour mixture into the wet mixture until incorporated. Be careful not to over-stir or the cakes will be dense. 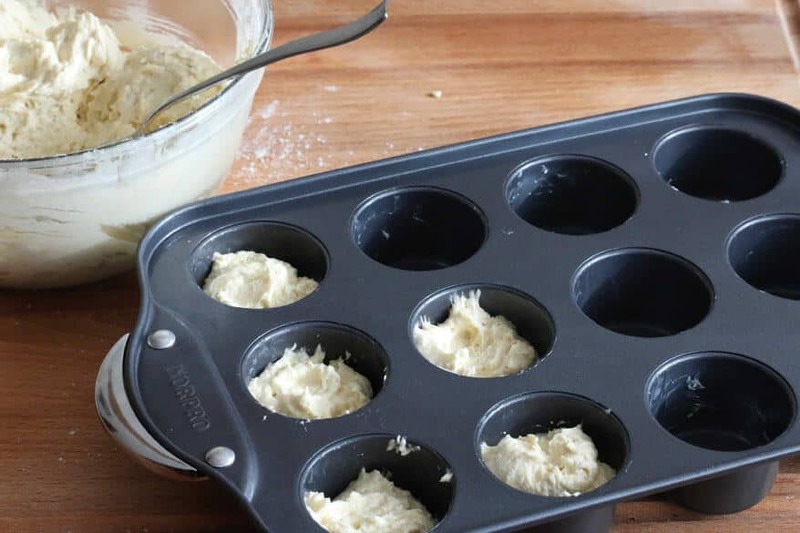 Spoon the batter into the mini cheesecake cups to the halfway point. Bake on the middle oven rack for 12-15 minutes or until a toothpick inserted into the center of a cake comes out clean. 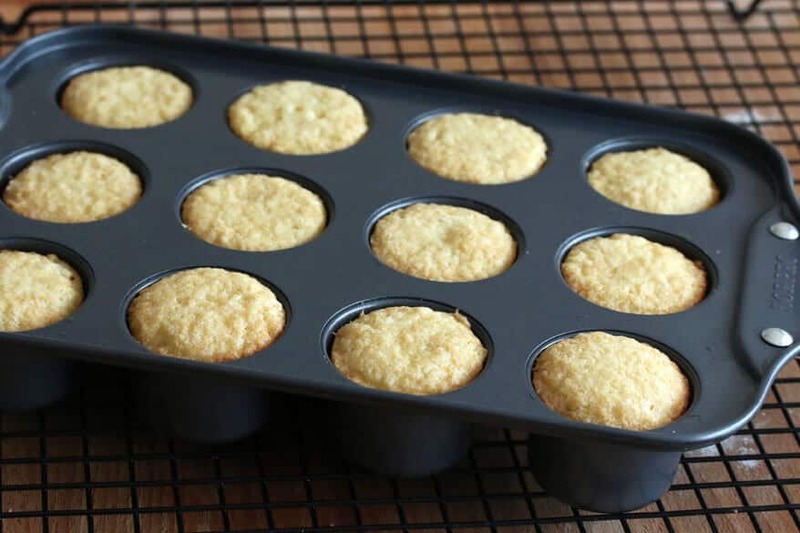 Allow the cakes to sit in the cupcake pan for a couple of minutes before transferring them to a wire rack to cool completely. To make the buttercream filling, beat together the butter, powdered sugar and milk until smooth. 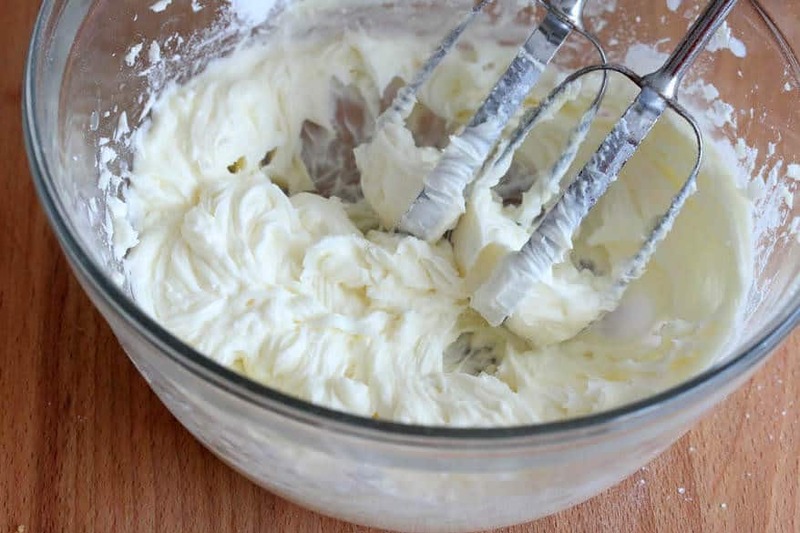 If the buttercream is too stiff, add a tiny amount of milk until a spreadable consistency is reached. If it's too runny, add more powdered sugar. 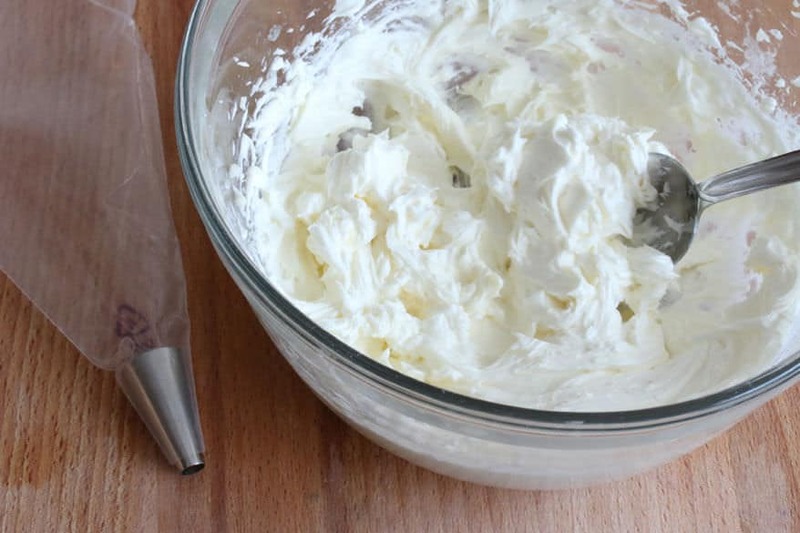 Spoon the buttercream into a piping bag with a medium or large round tip. Once the cakes have cooled completely, slice them in half. Pipe a dot in the center of the bottom cake half and pipe 4-5 more dots around the center dot. Spoon some jam on top, carefully helping it to run between the dots for a prettier presentation. Place the top cake half in position and repeat for the remaining cakes. Sift powdered sugar over the top of the cakes. Store the cakes in an airtight container. I would serve banana bread. I think mini lemon chiffon tarts would be lovely. I would enjoy eating some lemon sandwich cookies at a chic tea party. I would serve an assortment of muffins and cookies at my tea party! Yum! 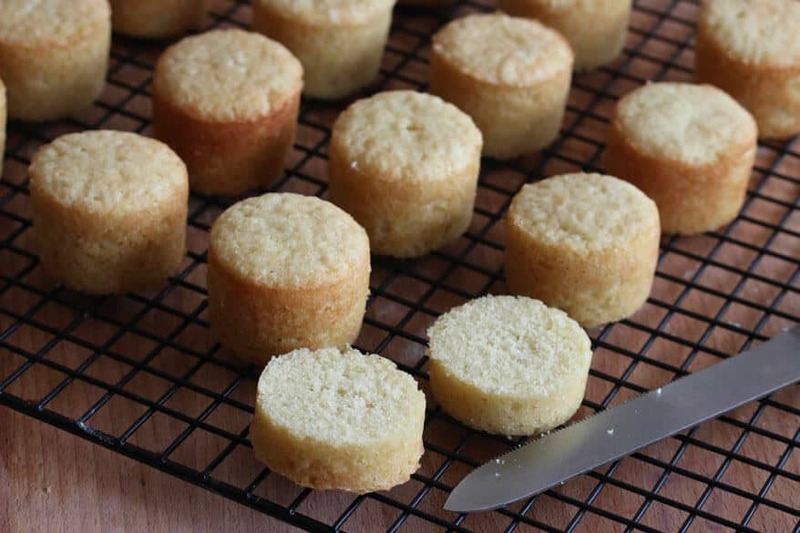 Your mini-sponge cakes look delicious! I might serve them with lemon curd. Or i may serve mini lemon mousse cups. The key seems to be mini-desserts! i tweeted about the giveaway and my twitter id is @yarbr012 https://twitter.com/yarbr012/status/497544961869742081. I would serve Danish cookies and mint tea. I would serve sugar cookies at an afternoon tea. I have always loved crumpets! I would enjoy eating Coffee cake and lemon tarts. Wow! I guess I’m totally out of touch with usual habits. I can’t imagine eating sweets in the afternoon that way. However, of all the things I’ve made in my time, I think I’d serve triple ginger cookies, which are probably my all-time favorite cookie. I would serve scones just because I love the sound of scones and it sounds so British with tea. Not very British, but eclairs are a personal favorite. These mini Victoria Cakes are adorable. I’ve never made scones, but now I want to – having an afternoon tea sounds like fun. I would serve butter cookies. I’d love little bits of shortbread. I would serve petite lemon bars. probably scones, graham crakers, cheese and crackers- lots of cake and cupcakes too! Victoria Cakes (since I was named after my grandmother who was named after Queen Victoria) and traditional cucumber sandwiches. I think I might make some classic yellow cake cupcakes (I do like your cheesecake pan though, I want to buy one of those). I would enjoy white chocolate lemon truffles at a chic tea party. I would serve scones, jammy dodgers, a swiss roll and of course a Victoria Sandwich. I love a pure shortbread cookie with tea! I would serve mini scones, Madeleines, mini muffins and butter cookies. I serve Mint Milano cookies with tea. 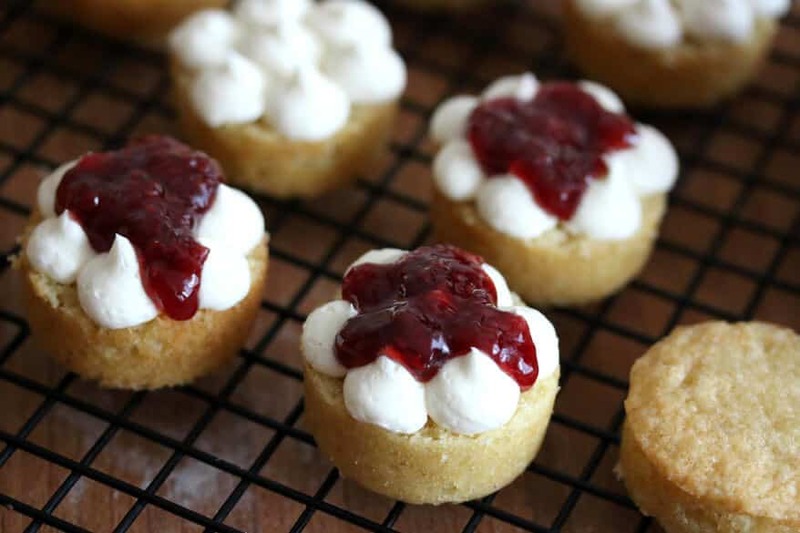 I’d want mini scones with clotted cream. 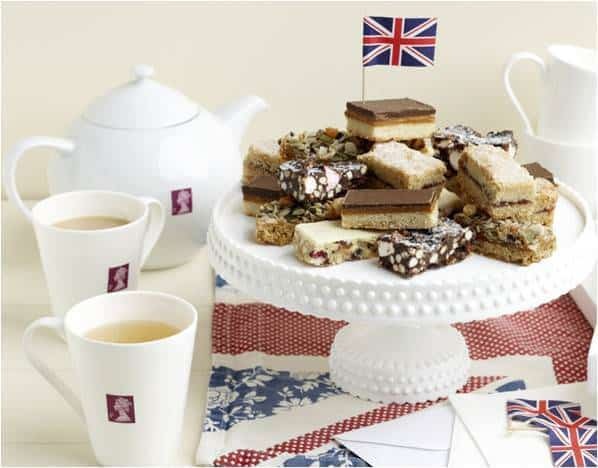 I would enjoy Millionaire Shortbread Bars along with your mini Victoria Sponge Cakes. These looks so divine that I would like to share them with others at a tea party. I would serve lemon bars at my tea party. I would have Pecan Butter Ball cookies. I love a good shortbread cookie with tea. I’d serve some cookies or scones. I’d like to serve an assortment of cookies, scones and tea cakes. I would probably serve some blueberry scones and some assortment of little cookies. I would serve my homemade triple berry pie! Mmm. I’d serve scones and some little lemon and raspberry tarts. I would enjoy having some Mexican tea cakes. For a tea party, I would serve cucumber sandwiches and a light lemon cake with an assortment of teas. I would love to serve mini cheesecakes! I would like to serve Russian Tea cookies with tea. I would like to serve some type of little tea cake or try this recipe to serve. I’m not a huge sweets fan, but your recipe is delicious! I would like to eat petit fours at a tea party! I would definitely enjoy these cakes! And I love mini-cannolis! Would always love these darling and yummy little cakes. Also mini cream puffs and fruit tarts. The list could go on and on. I’ve never had a tea party, but those yummies you have made look like the perfect thing to serve! My favorite, lemon meringue pie. i enjoy pecan tarts or snickerdoodles with tea! I would serve a variety of spicy scones, buttery shortbreads, and savory mini quiches! mmm! I would serve chocolate chip cookies, of course! I would serve mini cherry cheesecakes at my tea party. Your little sponge cakes are beautiful; I’m sure they’re delicious, too! I would serve scones at my tea. I would serve ginger snaps, pound cake and banana/chocolate chip bread. I would serve an assortment of mini cheesecakes. I would like to have Cinnamon rolls. I would toast a slice of vanilla pudding cake cover it with homemade Devonshire cream and a little tart cranberry jam with a nice cup of earl grey tea! I think from being in the south it would have to be peach cobbler. Excuse me,but how many cakes will we get from this amount of dough? Hi Anastasia, this makes about 20 cakes. 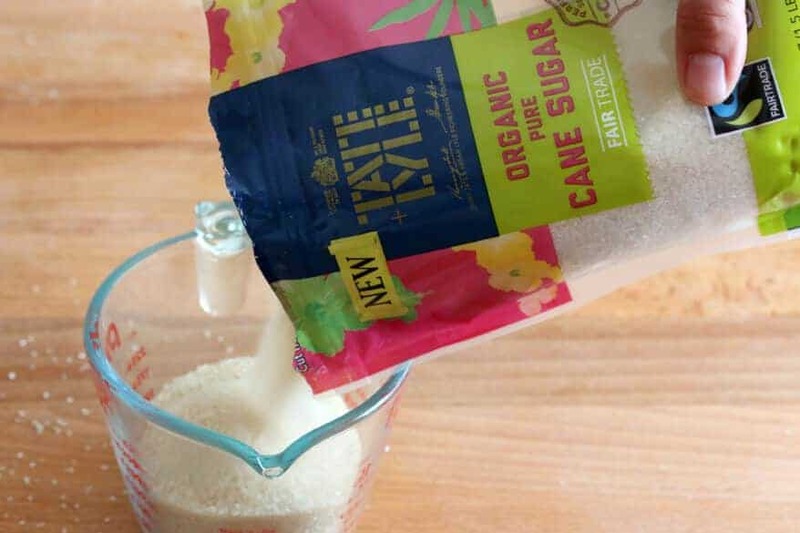 Is it okay if I replace the cane sugar with granulated sugar? Hi Ana, yes that’s fine. Happy baking! Scones and Victoria Sponge cake. LOVE afternoon Tea. I would serve cranberry white chocolate short bread cookies or blueberry scones. How far in advance can I make these? I am wanting to make them for a bridal shower, but obviously would like to not make everything the day of the shower. Hi Melanie, I’m sorry for the delayed response, we just got back from vacation. The cakes you can make a couple of days in advance (keep them in an airtight container) but the filling will need to be done the day of and kept refrigerated so it doesn’t become runny. Hi Sanika, it makes about 16 mini sponge cakes. First batch I made turned out fab! So for the next batch I was not able to find the same brand of sugar and they didn’t turn out as well. I used home made raspberry jam in them and they were delish. I sent the bad ones with my hubby to work. They are a group of guys who don’t need perfect cakes. LOL, Sama! I’m sure those guys were thrilled to get them. So glad you enjoyed these and thanks so much for the feedback! This is a fairly universal recipe, and I made 2 batches and knew the butter ratio was too high for the ingredients because they wouldn’t rise properly. 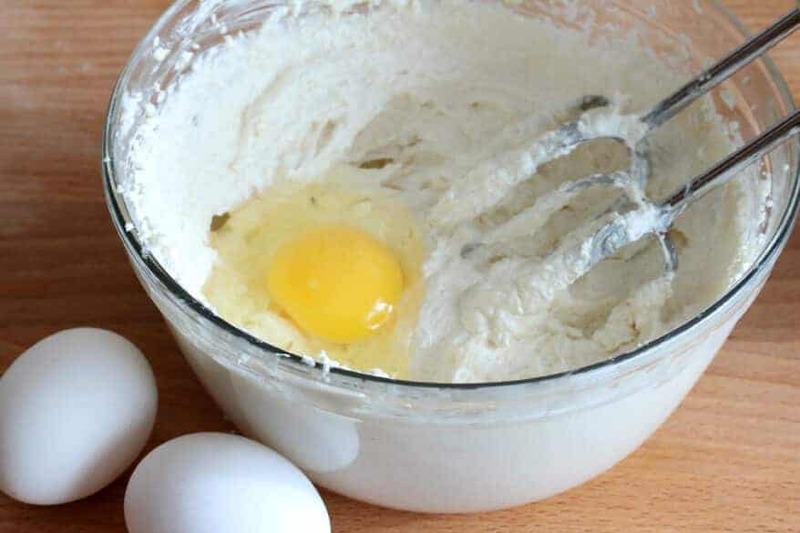 I researched and many other sites had the exact same recipe with 4 eggs instead of 3. 4 eggs is perfect and they came out beautifully. 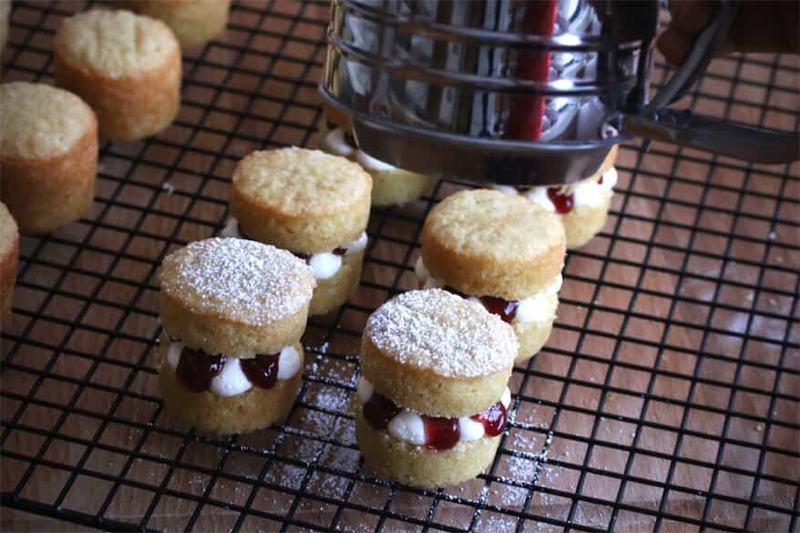 I want to try this recipe but may I know what is the individual hole size of that mini cheesecake dish tin you’re using? Excuse me, but how much is a cup in grams? This was SPECTACULAR!! It was a serious hit this Mother’s Day!! Do you have any idea how I could turn this into one normal size cake? I’ve just gotten requests to make this for birthdays is all! Definitely making this every year as the mini size though! Wonderful, Catherine, I’m so happy to hear that, thank you! I haven’t tried making this particular recipe in cake form but don’t see why you couldn’t – just do the toothpick test to check for doneness after the directed baking time to see if it needs to bake a little longer (insert the toothpick into the center of the cake and if it comes out dry it’s done). I just made these and although the flavor is amazing, the cakes all fell in the middle. Any clue why? I tried your recipe but my cakes fell. I’m thinking it’s becasue I am at high altitude. 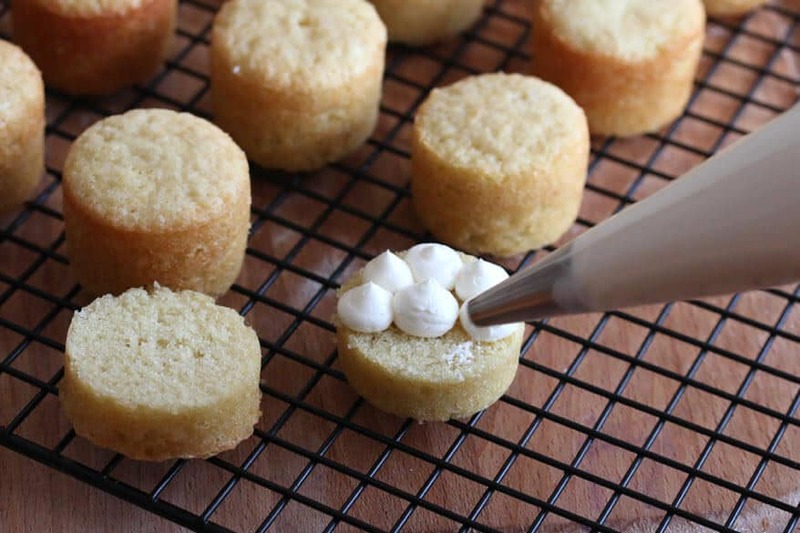 Do you have a high altitude conversion for your mini cakes? I really want to try them again. Thank you! Hi Kate, I don’t have that conversion info, I’m sorry. There are general guidelines based on what your specific altitude is and a quick Google search should bring up that info. Tried to make these… not light and fluffy at all! Tasted almost like cornbread! I made these for the Royal wedding but on a sheet pan and used a heart shaped cookie cutter to cut them out. These cakes came out perfectly…were so festive and absolutely delicious! I will be making these again and again! Everyone LOVED them. Thanks for the recipe! Wonderful, I’m so happy to hear that, thank you Megan! Thanks so much, Destiny, I hope you enjoy them! Wondering if the cakes (without icing and jam ) can be made and frozen ahead of time? Hi Doreen, yes they can. Just be sure to thaw them completely before spreading on the icing and jam.